This course has been designed to give delegates a more thorough understanding of food safety. It will outline the importance of food safety procedures, risk assessment, safe food handling and correct kitchen behaviour. 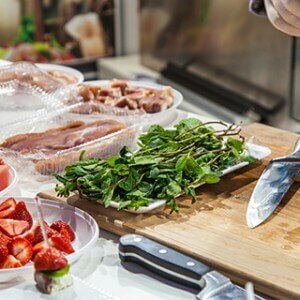 During this 1 day course, you will think about how you can prevent food contamination, why personal hygiene is essential and the best method of cleaning work surfaces and equipment. After you have completed this course, you will know how to safely store, prepare, cook, chill, reheat, serve and transport food. Our experienced trainers will demonstrate how to regulate temperature control in the kitchen, which will help when it comes to taking deliveries, storing food and rotating stock. At the end of the day, you will be assessed on your understanding of what you have learnt and the students who pass will be given an official Level 2 certification. To increase the student’s knowledge and understanding of food safety in their workplace role. This course is ideal for employees that prepare food in the workplace. Delegates do not have to hold any prior Food Safety qualifications in order to sit the Level 2 Food Safety course. Many catering-orientated jobs require staff to be qualified to this level at least, so it’s a good idea to complete the training if you are interested in working with food. The topics covered are regarded by the Foods Standards Agency as being very important in maintaining good hygiene and safety. This programme is accredited by Highfield Awarding Body for Compliance (HABC). HABC Level 2 Award in Food Safety in Catering has been accredited by the regulators of England, Wales and Northern Ireland and is part of the Qualifications and Credit Framework (QCF). The regulators are Ofqual in England, DCELLS in Wales and CCEA in Northern Ireland. It is also supported by People 1st, the Sector Skills Council for hospitality and catering.